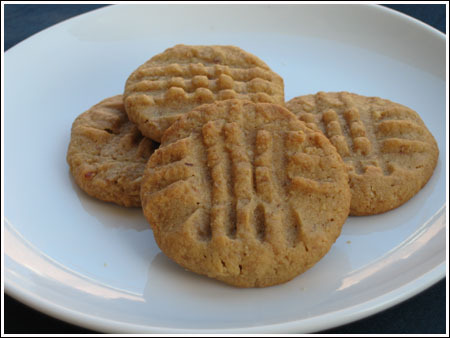 Chunky Peanut Butter Cookies with Wheat Germ are semi-nutritious cookies made with extra crunchy peanut butter, wheat germ and honey. Like most peanut butter cookies, the cookies are slightly soft, but the wheat germ adds a bit of a chunky texture. Because of the honey, the cookies stay soft and dense and seem a little less dry. 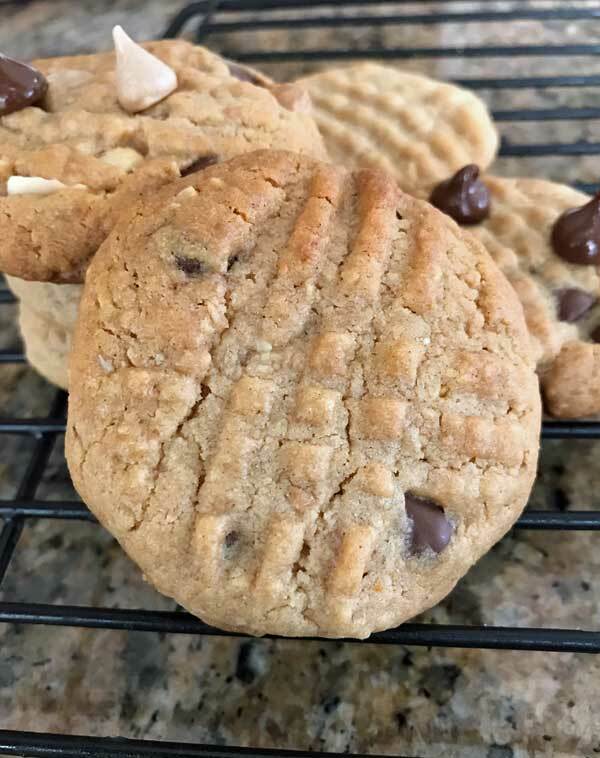 These can be made with or without add-ins, but if you want a truly chunk cookie that lives up to the name, I recommend adding a handful of peanuts or some kind of chips. And finally, a good twist on this recipe might be to use white whole wheat in place of the all-purpose. While regular whole wheat might give the cookies too much of a wheat flavor, white whole wheat flour should add just a bit of flavor and nutrition. In a mixing bowl, stir together first 6 ingredients. Combine dry ingredients and add to peanut butter mixture. Stir until well blended. If dough seems very soft, put it in the refrigerator for about 30 minutes. Otherwise proceed as directed. Shape into 1 inch balls and drop onto parchment lined baking sheets. Press down with a moist fork to make criss-crosses, then bake for 10-12 minutes (or until they appear lightly browned around the edges). Let the cookies cool completely before serving. They are much better when completely cool. Wheat germ is a pretty important ingredient in this particular recipe. If you can’t find wheat germ, it’s probably best to consider a different peanut butter cookie recipe. Um what if I don’t have wheat germ or it’s not readily available?? can i still make them without it? or what’s a good substitute for it (if there is one)thanks!! I haven’t made these in a while, but I do remember them as being very good. Glad the residents liked them….and you too! I made these last night and brought them to the hospital with me today (I’m on call!). I think these are great and love the addition of wheat germ. All the residents, all guys today, have really liked them! Definitely will make again. Oh how exciting, T. I hope you like them. I am making these right now. I substituted creamy peanut butter because I don’t like nuts in my cookies, and I added what I thought were peanut butter chips, but were really butterscotch chips because apparently I have forgotten how to read. Hopefully they will be good anyway! More cookies for me to try!! I may have to try this out on my car guy!